QuietPC Mambo Windows Media Centre – almost silent! Whilst Windows Media Centre is a fantastic addition to the living room, it does need an adequately specified PC which is often not the easiest to procure. UK users, in particular, suffer from a distinct lack of Media Centre-oriented machines from the likes of Hewlett-Packard and are left with building their own. Building one’s own Media Centre is not for the faint hearted, either. I thought I knew what RAM to buy, what CPU was best, what graphics card to use, etc. Not anymore. Whilst the architecture behind PCs is often quite simple, the combination of components such as chipsets and even RAM modules can contain hidden gotchas which will cost in performance. I came across QuietPC, which is a company that specialise in quiet PCs, including a line of Windows Media Centre machines. I went for their Mambo, which housed a well specified and optimised, custom-built PC within an unassuming case specifically designed to sit within a living room without fuss. Specifying and ordering the components was really simple, with explanations given for each option. This was invaluable for some of the more esoteric components such as the noise filters which supposedly suppresses EMF from disks from interfering with the audio circuitry. The processor is cooled through heatpipes routed around the case, which itself acts as a heatsink. I opted for an SSD for the primary disk so I not only got silent operation but also that “[almost] instant on” effect which one expects from living room appliances. I had to admit to being a little reluctant to opt for Windows 8, having 3 perfectly good licenses already, but due to the enhanced driver support for the TV card and HD content it was a no-brainer. It is worth making sure that you get the Windows 8 Pro SKU and post-purchase, download the Media pack which only costs £6.99 from Microsoft using the Windows Features option in Control Panel. I was pleasantly pleased with the ability for the TV card to handle 2 HD inputs and find the whole system very responsive. Those second delays between remote control press and action can create resentment. I was really impressed after ordering I was contacted and asked if I was prepared to wait a few days before the machine was built so I could take advantage of Intel’s new Haswell chipset. I know from previous experience that Intel chips are power hungry and can run hot, making it even more difficult to keep noise levels down. The Haswell chipset is the latest enhancement by Intel to improve on their record on power efficiency, therefore heat efficiency and ultimately, noise levels of fans, etc. When the kit arrived, it was all built and prepared and ready for plugging in. Not only that but all the extra bits and pieces from the motherboard, etc. were included. After 24 hours, the system was configured and achieving good GAF levels! (Although after the Panasonic FreeSat+ device we were using, this wasn’t too hard.) The machine is pretty much silent, too, earning it the highly sought after living room position. The only sound you hear is an occasional ‘click’ of the disk heads on the secondary disk. If I was to highlight issues, there were only a few. Firstly, I asked if adding the graphics card would route the audio of the onboard sound through the alternate HDMI socket on the graphics card. I was told that this would be the case. However, on installation, this seemed not to be so. Luckily, my Onkyo receiver is able to combine HDMI video with the SP/DIF from the sound card into a single output so this wasn’t an issue once I’d figured this out. There was an oddity with the Windows 8 licence, too. I bought the Windows 8 System Builder edition, which comes with the product key on the bottom of the machine. Upon entering this, the Windows installation finalisation process couldn’t recognise the key. Further, when ordering the Media pack, the presumed product key already installed did not match the product key sticker! This has been resolved satisfactorily, however. Finally, as I am moving from a consumer-grade FreeSat+ platform to the underlying satellite channels, marrying the data with the actual channels was particularly arduous. With around 1,500 channels, some live, some not broadcasting whilst configuring, some not working and some scrambled, this turned out to be challenging. Though we did have some fun discovering some pretty whacky content out there! The team at QuietPC were again very helpful with the final steps of this, which involved re-locating the HD channels for BBC One, BBC Two and Channel 4. They sent me to a site with all the details on and it was up and running within 10 minutes. Overall, a very positive experience both in terms of product quality and service. 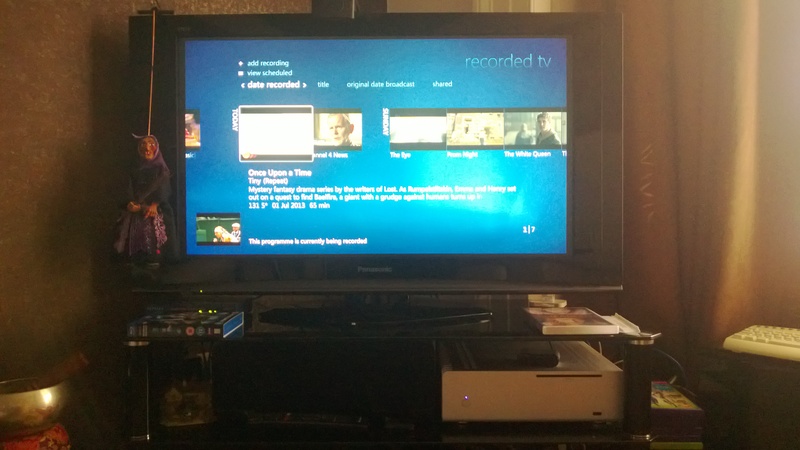 The Windows Media Centre is happily working in HD, with dual tuners, with my music and picture library with two XBox 360 Extenders allowing viewing/listening of content in other rooms in the house. Perfect! I’m giving my old Windows Media Centre machine away, with a licence of Windows 7 Home Premium.